The only thing we very missed was a proper cffee machine. There was a Nespresso machine but it was to difficult to buy the cups for it. Supermarkets do not sell it Nespresso cups. 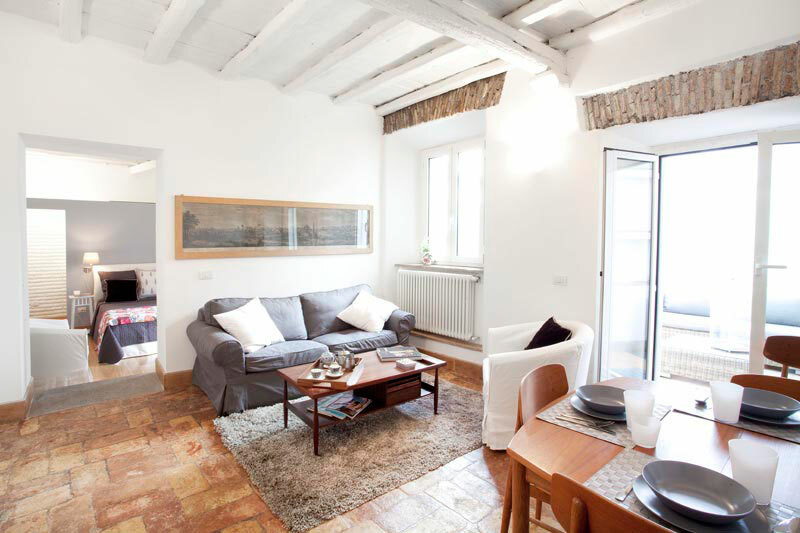 You will find this charming apartment in the Trastevere area. In this neighbourhood you can perfectly re-experience the old Roman world while enjoying a contemporary lifestyle. 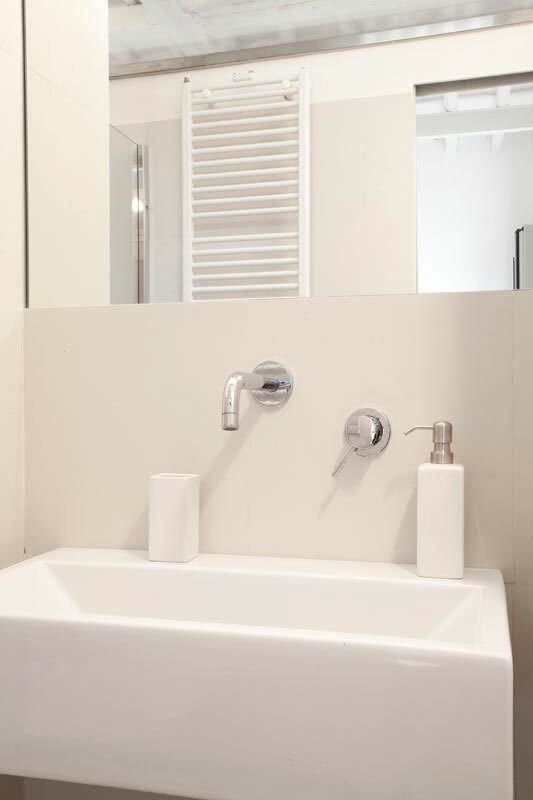 The apartment has been recently renovated but some original details have been preserved. 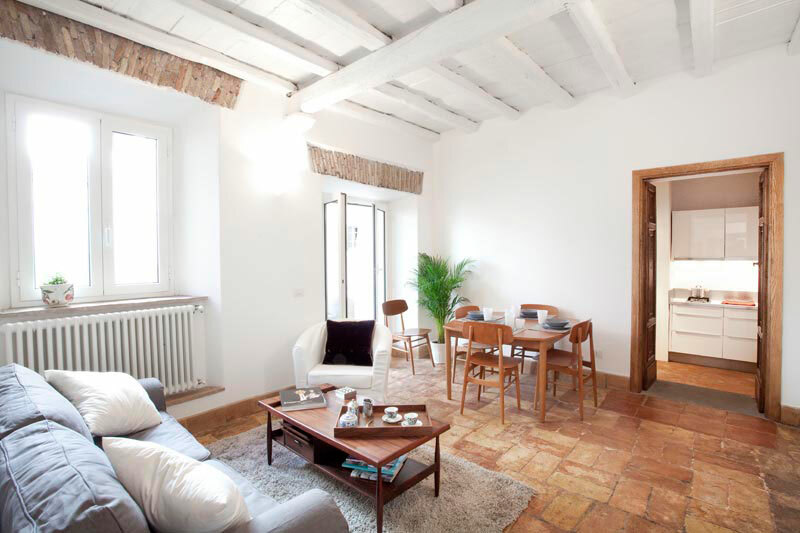 For example, it exhibits cotto tiles on the living room floor and typical wooden beams in the ceiling. Despite its position on the lower floor of the building, this part of the apartment enjoys a nice and very luminous ambiance. In the living room, you can find a comfortable double sofa bed, and a wooden coffee table. There is also a delightful dining table for up to 4 people. The kitchen is small but modern and very well equipped. It provides a dishwasher, a washing machine and everything needed to prepare a good meal. 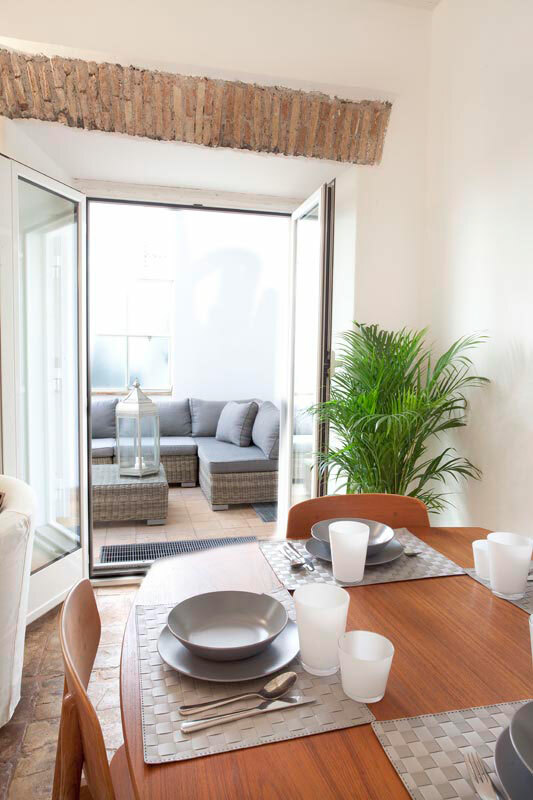 Together with the dining area, you will thus have the perfect spaces in which to prepare and then enjoy a homemade meal in the comfort and peace of a private space. On the opposite side of the house, you’ll find a spacious bedroom with a king size bed. Behind the bedroom you can also access the refurbished bathroom. 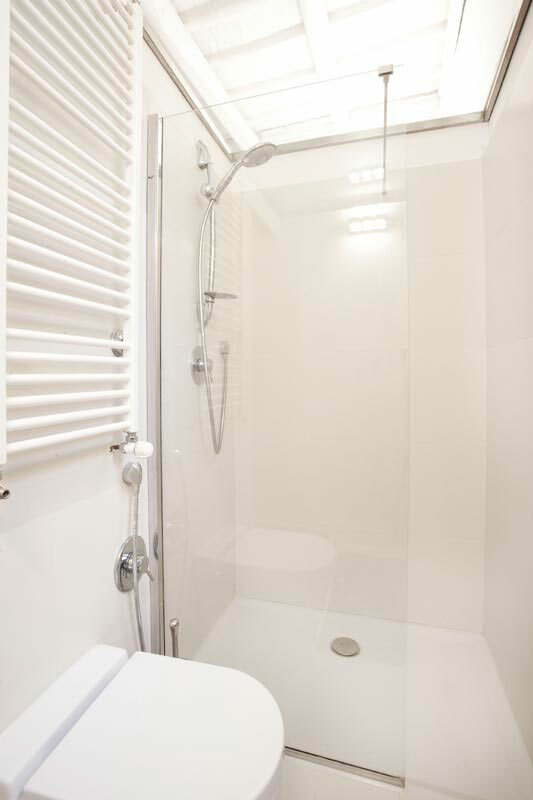 This offers a big shower with a glass door. 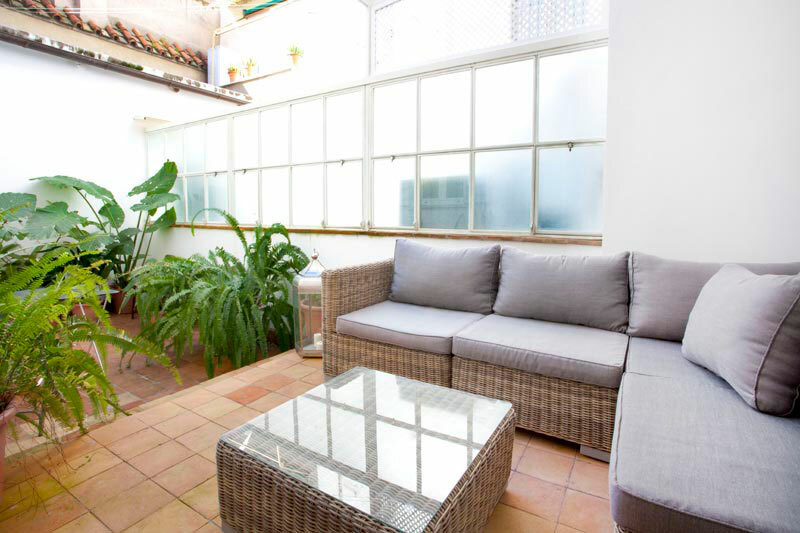 The apartment moreover boasts a beautiful and comfortable private courtyard. 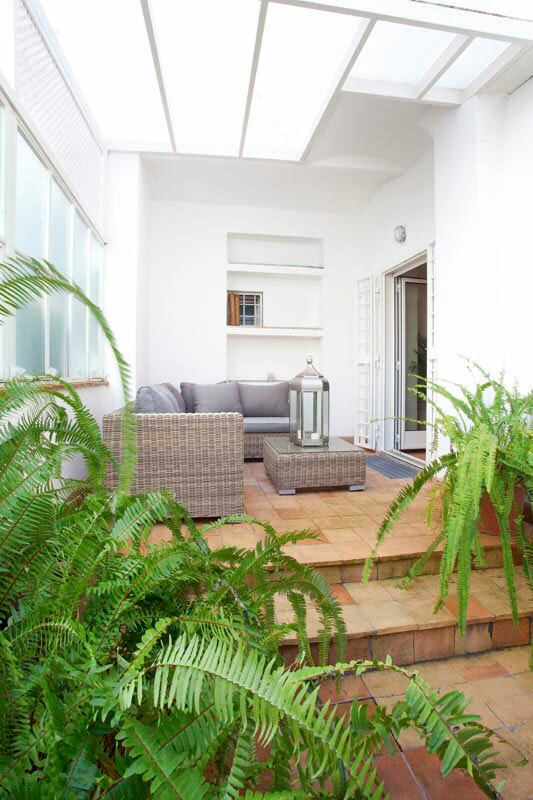 This area features a big stylish corner sofa, and many well kept plants. The courtyard also offers a small table. Here you can enjoy your breakfast under a sunny sky, or some wine in the evenings. From this apartment, it will only take you a few minutes to reach one of the loveliest squares of Rome, Santa Maria in Trastevere. Here you’ll find one of the most beautiful and oldest churches of the city. 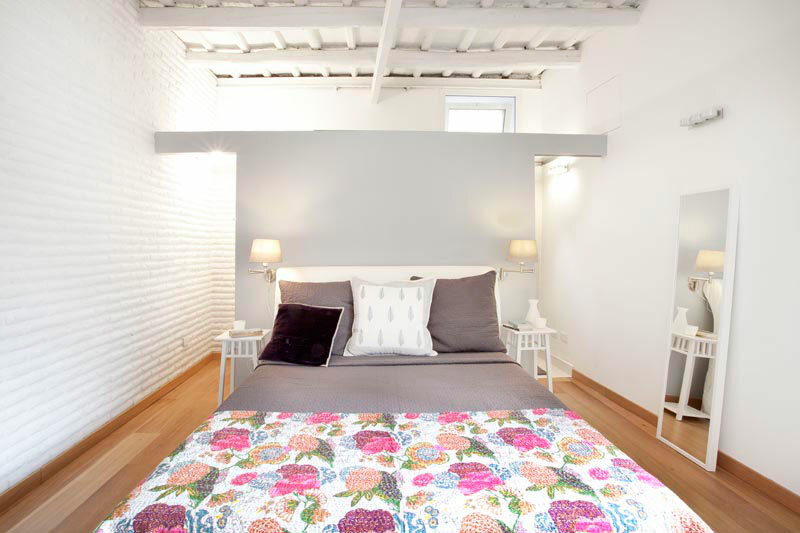 You can find this apartment in Santa Rufina square, the heart of this neighbourhood. Many bars and restaurants inhabit this area, making it lively and welcoming. This is the perfect place to relax after a long day of sight seeing. Moreover, the Trastevere area really comes to life in the evenings, and its atmosphere is just delightful. Simply by sitting in one of its piazzas, you can soak up this warm ambiance whilst nibbling on a pizza, or enjoying a gelato. Heading across the river, you can visit the pleasant Campo de’ Fiori, and the lively Piazza Navona. Nearby you will also find the Pantheon and the Castel Sant’Angelo. Take a trip into the Jewish Ghetto to find some extremely authentic Roman-Jewish cuisine! This unit was perfect fit for our needs. A fresh and cozy appartment with lots of charm, just as pitcutured in the photos. The porch area is half covered and protected from the elements. The other half is open air between buildings, very cozy. It’s the best of both worlds. Privacy on one side, open air to dry your clothes on the other. I did not ...Read Morepick this detail up in the photos. Easy communication and nice airport pick up on the day of our arrival. The apartment is in a great location and well outfitted. Our kids slept on the pull out couch and found it very comfortable. Despite being in the middle of everything the apartment is very quiet in terms of noise from outside. Since it is a ground floor apartment there was the n...Read Moreoise of the people above us, but that is city living. Over all a great place to stay in Rome. 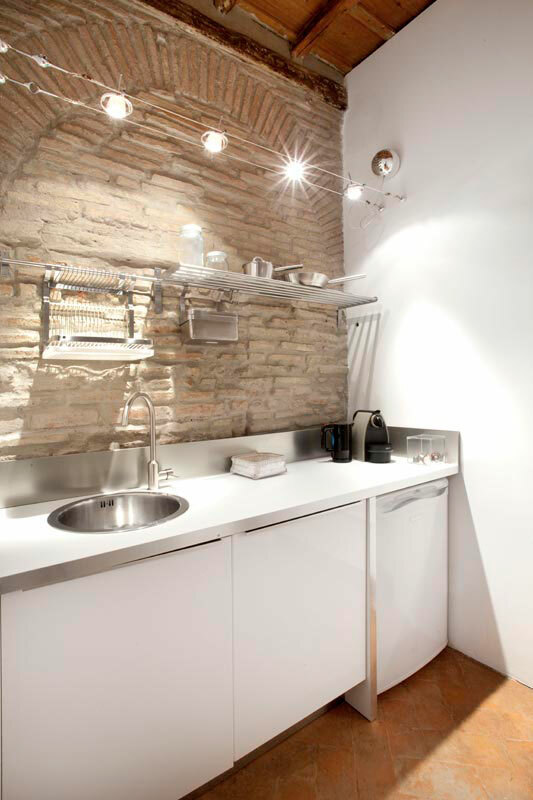 We loved the Trastevere bright apartment for our six-night stay in Rome. It's in the middle of a neighborhood brimming with restaurants, wine bars, gelato shops and more (we never had to leave Trastevere in the evenings in order to have lovely dining experiences). The apartment is also very well located for sightseeing; it's barely a two-...Read Moreminute walk to Ponte Garibaldi, so it's a quick trip over the Tiber to get to many major attractions, including the Roman Forum and Campo de' Fiori (it's about a 15-minute walk to the Capitoline Hill area, which we did several times). The apartment itself is, in fact, very bright and spotless, and the bed was extremely comfortable. Booking with RomeLoft was seamless, and they answered all my questions promptly. We were a couple with one child staying in this apartment during July. Rome Loft staff (Nissar thank you especially ) were fantastic with their service and help. We were really impressed by the location which was in the heart of Trastevere but in a quiet square. The apartment itself is ground floor at the back of the building, so no street noise. T...Read Morehe best part was the beautiful internal courtyard which gives the apartment an extra room and a nice light airy feeling. Decoration is tasteful and not overly intrusive or fussy. The bathroom is compact yet practical. The bed was comfortable. We walked everywhere in Rome and we're delighted each trip to come back to our little apartment. Thank you again Rome Loft and we will come back as soon as we can! We had a great time in Rome and this apartment was just perfect for us. We are a family of four with two girls aged 11 and 13 years. The apartment was very modern and well equipped, with everything you would need including some basic supplies - washing up liquid, dishwasher tablets, hand soap, olive oil etc. But most useful were the travel guides a...Read Morend maps that were available for our use. The bed was very big and comfortable and the air conditioning was very good. The girls were perfectly comfortable and happy on the sofa bed and the open plan nature of the apartment wasn't an issue at all. We loved the unique way the little apartment had been converted to make a great home. 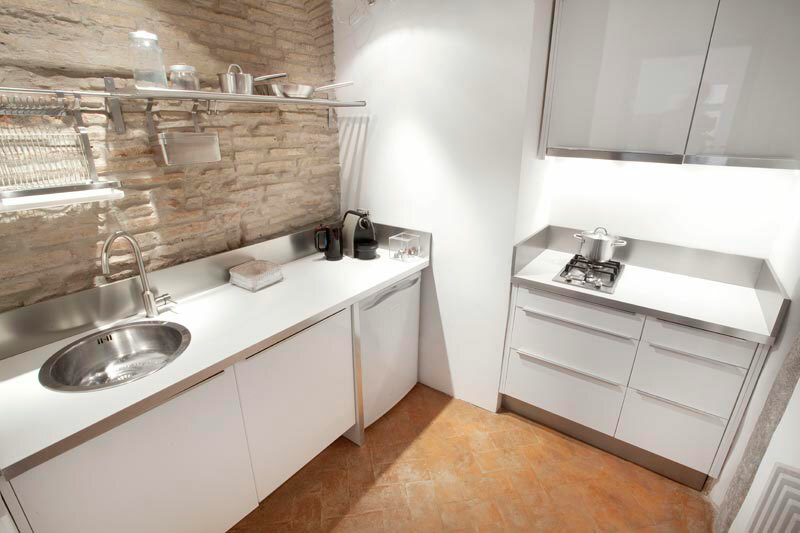 The location was excellent right in the heart of the Trastevere and within easy walking distance of every main site. Despite the area buzzing with bars and resturants the apartment was so quiet and became a peaceful retreat. Rome Loft were excellent and really very helpful, the taxi service to and from the airport was brilliant. 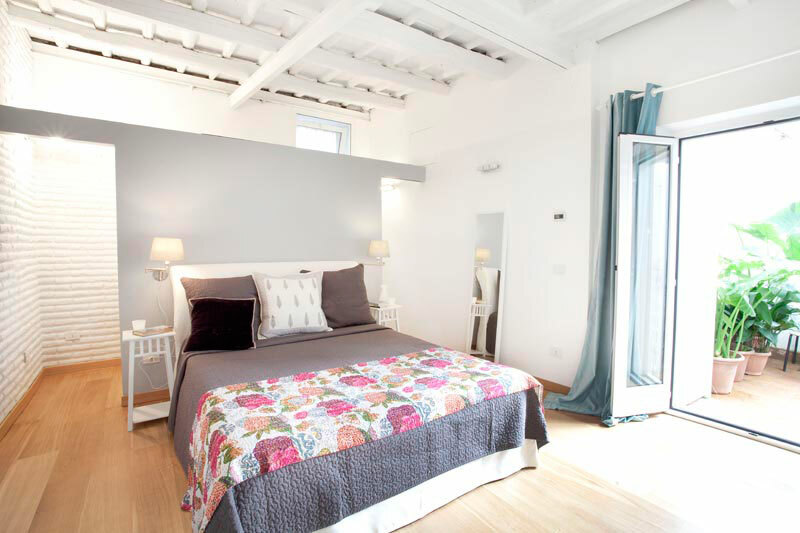 Will definatly use Rome Loft again and would have no hesitation in recommending this aprtment for a perfect stay in Rome. From the time we got off the plane until we returned to the airport, our experience of Rome with Rome Loft was outstanding. The taxi drivers both to and from the airport were very courteous and even though they didn't speak fluent English, they had conversations about the areas we were driving through. Our apartment on Rufina was in the most i...Read Morencredible location, Trastevere is colourful, vibrant, authentic, lively, and the locals were always friendly, interactive and helpful. We found that the collection of books on Rome that were in our apartment were like our own personal tour guides. I think I used every page! Great idea from the owner and beyond useful. The facilities in the apartment were great too, excellent bed, shower are and kitchen. The terrace was excellent and that is where we spent most of our time when we were not out and about. The staff member that greeted us on arrival also deserves praise as she was smiling, courteous and even though she didn't speak much English, she let us know all the functions of the apartment. I think that it is helpful for the customer to make a little effort and learn the basic language anyway, it makes transition easier! Lastly I would like to give a massive thank you to the staff that helped us though the booking stage, before we actually arrived in Rome. 5* service and an absolute credit to Rome Loft, unfortunately we don't have a name but hopefully our gratitude can be passed on to this person. If I can maybe offer a pointer that may improve future customers' stays? We found the amount of restaurants in the Trastevere area overwhelming and trying to decide where to go was tricky. As expected, some places were excellent while others left a lot to be desired. If future customers could be offered recommendations on where to eat I imagine that would be very helpful. My own personal recommendations are: Le Mani in Pasta on Via Dei Genovesi; Trattoria Da Lucia on Vicolo del Mattonato; Pizzeria Pan'Unto which was directly facing the apartment on Piazza di Santa Rufina. All excellent food and top quality customer service ???? Again, thanks for ensuring our holiday was great and creating some lasting memories! We stayed for 10 nights in this apartment. We are frequent Rome visitors and love Trastevere. This apartment is perfectly located, amazingly quiet and spacious. We find Rome Loft helpful and esay to get on with. Welcome was on time and as expected and this time we used the baggage store for a few hours after check out and that was also terrific. Ca...Read Moren thoroughly recommend everything. We loved the apartment and it's location. The owner was out of the country when we arrived and we had difficultly gaining access on the front end and paying before we left. Rome Lofts tried to help but their agreement/relationship with the owner didn't allow them to adequately intervene on our behalf. We resolved the above by being to...Read Moreugh with the owner and with Rome Lofts. Despite the issues, we loved the apartment and it's location in all respects. The absence of a secure handshake/understanding with and between all parties was a distraction. This apartment is in a wonderful location right amongst the bars and restaurants of Trastavere. We were worried when booking that it might be too noisy for our family or four but that was not the case at all as the apartment is in the center of the building set back from the street and is very quiet. The bed and sofa bed were really comfortable an...Read Mored the apartment had everything that we needed. The outdoor terrace was delightful and we enjoyed having breakfast and a glass of wine out there. It also allowed us to get our washing easily done at the end of a long trip. The friendly owner checked us in at the start of our visit and was very helpful and informative. Highly recommend this apartment as it exceeded our expectations.